How Do Dogs Get Mange? Tiny mites burrow into the skin, where they thrive and live off nutrients from the dog. It is on the skin where these microscopic mites reproduce, lay eggs and multiply. These parasites multiply at an extremely fast rate. This activity causes intense itching for dogs, and results in extreme scratching, hair loss, bald spots, and red and often infected areas of the skin. Two types of mange, sarcoptic and cheyletiella, are the most contagious, and can be spread through both direct and indirect contact with a dog or other animal affected with sarcoptic or cheyletiella mites. Sarcoptic mange is the most serious, as it can produce life-threatening skin conditions by spreading to all areas of the body. These mites are microscopic; they cannot be seen with the naked eye. Cheyletiella mites are large enough to be seen without the aid of a microscope. A dog does not have to come in contact with another dog affected with sarcoptic or cheyletiella mange to contract mange. 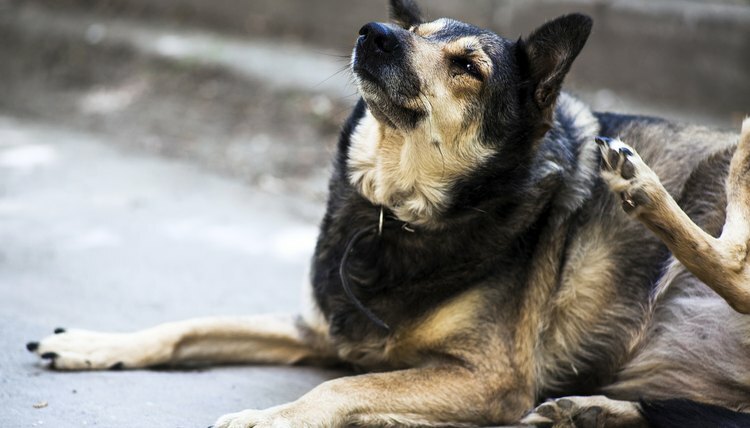 When either of these types of mange are present, a dog that comes in contact with bedding or any tangible item that an infected dog has had contact with is susceptible to contracting mange. Dogs infected with either of these types of mange should be quarantined from other animals until they can be treated. Both sarcoptic and cheyletiella mange are highly contagious, and can affect both humans and other animals. Demodectic mites cause another type of mange that is generally less worrisome for most dogs. Demodectic mange results when mites from the mother are passed to their puppy. These mites live in the hair follicles, and are essentially "part of the dog." Most of the time, these mites live on dogs without engendering symptoms. However, under certain condition--such as a compromised immune system, abundant stress, or when other unhealthiness issues are present--demodectic mites may cause scratching and hair loss. Typically, dogs with demodectic mange do not need to be isolated from other animals, as humans and cats are not suitable hosts for these mites and demodectic mange is not considered contagious. The best way to prevent mange is to maintain proper hygiene for the dog. Pet owners should provide fresh bedding, keep vaccinations current, initiate flea prevention and worming, and feed their pet a quality and nutritional dog food. Additionally, spaying females is recommended, so that hormonal changes, pregnancy and birthing do not add additional stress. Any pet suspected of having mange should be seen by a veterinarian for proper diagnosis and treatment. Where Does the Scabies Mite Come From? Are Bunny Fur Mites Contagious to Humans? Can a Coyote With Mange Infect My Dog? How Long Does It Take for Guinea Pigs With Mites to Lose Hair?